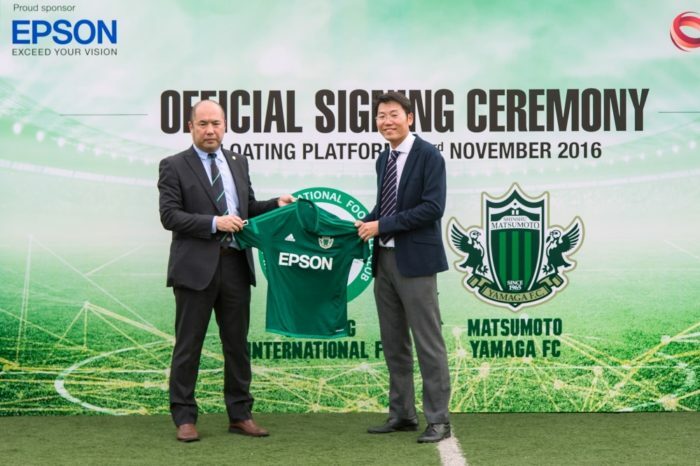 On 23rd November 2016, Geylang International Football Club (GIFC) from S.League signed a Memorandum of Understanding with the Matsumoto Yamaga Football Club from the J2 League. This MOU will enable both the clubs to share their knowledge and experience in order to strengthen the management and teams of both sides. By ways like exchanging players and coaches, this MOU aims at promoting the development of both the clubs and an overall development of football in Singapore and Japan and thus promoting the international exchange to further deepen the ties between the two countries. The venue for the MOU signing ceremony was the Floating Platform@Marina that overlooks the iconic Marina Bay Sands and the Merlion. Before the MOU signing, a football clinic for children aged 7 to 12 was organized. 80 children participated in this clinic conducted by coaches from both the clubs. 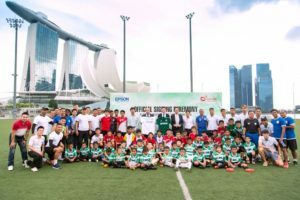 Epson, the manufacturer of precision instruments, is the sponsor for both the teams and also the Football Association of Singpaore (FAS), which has led to this partnership between the two teams. Epson has facilitated football clinic conducted by Matsumoto Yamaga Youth Team coaches for the youth players in Singapore in March this year. They have also facilitated other projects like inviting young players from Singapore to Matsumoto Yamaga.